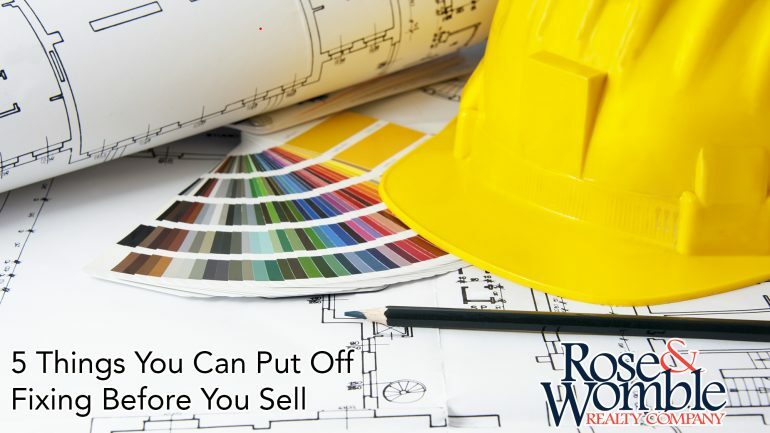 5 Things You Can Put Off Fixing Before You Sell - Rose & Womble Realty Co. Selling your home? Then you’ve likely had that rude awakening where a real estate agent tours your home and breaks some tough news: Your house needs work before it goes on the market. For starters, you’ll have to fix the boiler. And paint. And replace those outdated cabinets … the list might go on and on. Given that all these tweaks cost money, you might wonder: Do I have to do everything? Many of these fixes are indeed necessary, says Kathleen Kuhn, president of HouseMaster, a national chain of home inspection offices. “Any defect or condition that affects the intended function or operation of a major house system should be fixed,” she says. This would include taking care of leaks, built-in appliances not functioning properly, insect infestations, plus any imminent safety or environmental hazards. But beyond that, it’s up to you: Sure, the nicer your home looks, the more money you’ll likely be able to fetch when selling it. But not all improvements you make offer the same return on investment. Here are some fixes that some experts say you can pass on without too many repercussions. Cosmetic damage includes things such as scuffed floors or peeling paint: They don’t interfere with the function of your home, although they do make it look run-down. The good news is, a keen home buyer knows to look beyond that, says Craig Webb, editor of Remodeling Magazine. “Sophisticated home buyers and home flippers know that cosmetic damage can be easily fixed,” says Webb. What will give them pause is the hard stuff. “They are going to want to know that the electrical and plumbing systems are up to grade and that the utility bills are decent,” says Webb. If the home’s structural issues are sound and the “bones” are good, then you can let the surface stuff slide. So your kitchen is woefully outdated, your bathroom avocado green (yuck). That may be OK. Really. 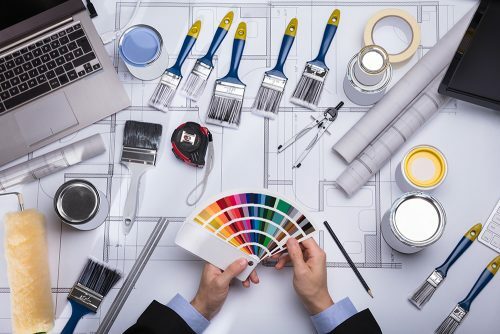 The reason: Many buyers these days look forward to remodeling these “fun” areas—plus, trying to second-guess what they want and have it there waiting for them is just plain unrealistic, given all the home decor styles there are to choose from today. If you do decide your kitchen and bathroom are so bad they’re worth redoing, don’t go halfway. Unless you can redo a whole kitchen, don’t bother with partial fixes. Older cabinets with brand-new granite countertops only highlight the old. We don’t care if the color du jour is violet—selecting “trendy” paint colors is yet another bad move. The reason: Color trends come and go so fast, what might look great today will look dated tomorrow or, even if they’re totally hip, might not appeal to large swaths of buyers anyway. There is a saying that Webb likes to use: “Too much house for the neighborhood.” In other words, if all the houses on your block are beautifully furnished and landscaped, then it likely is worth it to spend the extra cash on your own. But if your house is the only house on the block with a well-kept rose garden and indoor dog shower, you may not get the return you hope for. “No matter how much you try to have the jewel house to live in, you aren’t going to get the return on the investment if the rest of the neighborhood doesn’t match,” Webb says. So check out your neighbors’ homes and plan accordingly. Sasha Brown-Worsham has written for the New York Times, Self, Cosmopolitan, and other publications.